Sell SMS text messaging to ANY industry sector. No minimum volume. Instant setup. Ongoing revenue. Flexible hours. Ideal for Telesales. 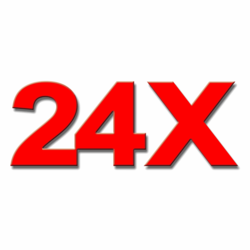 With over 7,500 happy customers, 24X Ltd are one of the UK's leading Business SMS suppliers sending over 12 million text messages a month. Our client base also includes some of the UK's most well known and highly regarded brands. We specialise in outbound SMS, Bulk SMS, SMS Marketing services, Email to SMS and Interactive SMS. Essentially, if a company needs to reach a large number of people via SMS text messaging - employees, prospects or clients - then they need 24X. These may be marketing messages, calls to action, notifications of deliveries or appointments etc. We can also receive replies from those people and deliver them back to you. We are now looking to expand into new markets and grow our client base by partnering with self-employed sales professionals with B2B sales experience. The best suited agents would be people used to telesales. The product is simple and easy to explain. There is no need for a face to face (unless it is perhaps a corporate deal). Agents who are used to sourcing there own leads and contacts. Agents who have a lot of contacts in a lot of different industries.